Ever had "one of those days"? A day when your I'm -fairly- laid -back- for- a -two -year- old two year old has the temper tantrum to end all temper tantrums? (Seriously folks, I think his head almost exploded. He turned purple, then blue, and then almost passed out- and later, I noticed little red pin-sized dots that look like teeny-tiny freckles under his eyes. I think his head did explode!) The child has probably had 5 temper tantrums his whole life- it's just not his thing, normally. But that day was just "one of those days." On those days, I love to escape into my neighborhood and take a brisk walk. Luckily my husband was around and I was able to get out. My neighborhood is so quiet (even at 9:30 am on a Saturday morning) and so park-like. It's not a fancy subdivision but everyone does their part to maintain their yards and their gardens. That particular morning the air was beginning to feel crisp, the sky was bright blue, and the birds were singing. It was so good to take my mind off things and notice the sights and sounds around me-- the neighbor's little red barn and American flag, the half-orange, half-yellow tree at the top of my hill that is just starting to change, and the squirrels scurrying to collect nuts even though there are about 1.4 billion acorns in the street in front of my house!! As I was out and about, I thought, "I need to get Logan out here to enjoy the fall." When I got home, I noticed this post in my google reader. It was such an easy activity. Little Wonders' Days used fall stickers on index cards to create a picture scavengar hunt. I couldn't round up too many stickers so we just cut out a few pictures and glued them on. As we went on our walk, we took pictures of the items we found. We came back home and made our pictures into a fall book for Logan. I wrote "I see a _________." on the left page and we stuck a picture on the right page. The walk was definitely what we both needed and our book helps us to capture those fun memories!! A great book that goes along with this activity is We're Going on a Leaf Hunt by Steve Metzger. See my review of this book + other fall books here. I am linking this up to We Play. 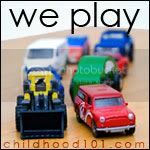 Check out all of the fab play ideas. Your child will never be bored again. (ok, I can't really promise that ;) But I do think kids of all ages can enjoy the ideas on this link up. I have given you the Versatile Blogger award. I always enjoy reading your blog entries! My son loves scavenger hunts too! I printed off a list with thumbnail images last year, and let him carry a little tote bag around with him and put things in as he found them. We are starting to do more activities with our camera, lately, though, so letting him take a photo of the objects is a really appealing idea too! (He just had his first photo "assignment" this week - just realized I forgot to post that in my weekly wrap-up. Oops, another day). Thanks for linking to We Play and your kind words about the meme.